It is hard to believe that Tim Moore is quite the couch potato he would have us believe. Although anyone daft enough to attempt to tackle the route of the 2000 Tour de France with even some training must be a sprocket short of a chainring. Moore claims less training than this and thus is the scene set for his comic journey through France, and his fourth book. For cycling enthusiasts this book is great. Feel Moore’s pain as he struggles up the first Pyrennean climbs. Share his sense of alcohol-induced fatigue at the end of each day and marvel at the blatant stupidity of the whole venture. Not that stupidity is a new feature of cycling. In recent years professional cycling has achieved a much higher profile thanks less to the exploits of Messrs. Armstrong, Ullrich & co. and more to the drug scandals that have threatened to destroy the sport. Moore takes us back in Tour de France history to show that this phenomenon is far from new. 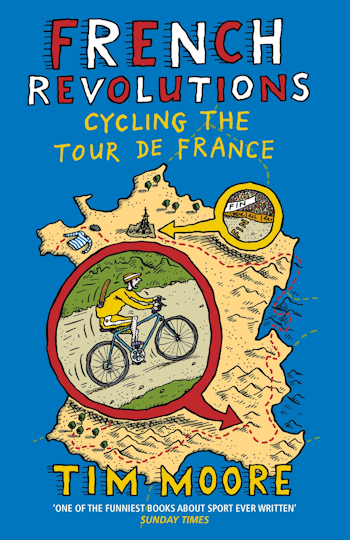 Particularly moving is his account of the legendary Tom Simpson who died on the fearsome Mont Ventoux from a lack of oxygen and, it seems, an overdose of barbiturates. Some of Moore’s personal anecdotes, however, are a little hard to believe, and some reviewers have criticized his “mock everything” approach. For me, it still works. He sets out his stall from the beginning and mocking everything includes mocking himself. Somewhat inevitably, as Moore’s fitness improves over the course of his month’s odyssey, the cycling become all-consuming and he lapses at times into a pedal-by-pedal account that may be of less interest to the non-cycling reader. The book may start coasting downhill towards the end, but this does not detract from the overall read, nor from the climax of the story which is well worth hanging on for. Overall verdict: If you like cycling, you’ll love this.